Today’s Halloween Biff avatar is hungry! I totally know that feeling D: It’s like the beep noise before a voice message erases just enough of my communication skills that I sound like a 4-year old was handed the phone by his parents in an attempt to be cute with relatives. 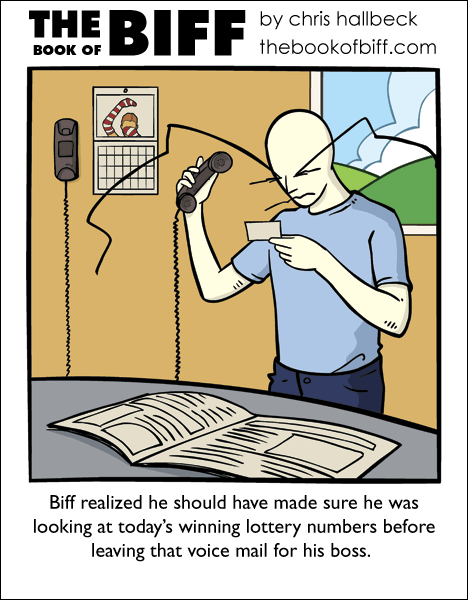 I love how Biff is stuck in the early 90’s with a corded phone with a 30 foot cord. I looked at the picture and was confused, then I read the caption and almost fell out of my chair with laughter. I love the picture on his calender, I remember that artist you’ve linked to a few times Chris, nice little detal! You spelled hang wrong, I would love to see how you hand up the phone it sounds very interesting. Certainly! He has a job, after all. I winced at this like most men wince if they see someone get kicked in sensitive areas. Also, today’s bifftar is terrifying. Glad to see I’m not the only one with that affliction. I hate answering machines and voicemail. I want to talk to the person and then the answering machine picks up and I have to quickly come up with a short summary of what I wanted to say. My mind doesn’t work that fast! So I end up hanging up and calling back later, usually being asked “Why didn’t you leave a message?” GAH!!! Forgetting to read carefully week! Or look before you leap week! *dance music playing*, oh, sorry, im a little busy partying, leave a message and ill call back as soon as i can! About the questions about Biff having a boss…I’ve finally come to the conclusion that Biff can change into whoever he needs to be for the next comic. Oh, and nice job bringing Ali back, I thought the calendar was a mummy in the preview.